Thread Check, Inc. offers a complete line of AGD ‐ American Gage Design, adjustable metric thread ring gages and truncated set plugs. Thread ring gages and set plugs are manufactured per ANSI/ASME B1.16M. Thread ring gages and set plugs are manufactured to an X tolerance in a 6g class of fit. Thread set plugs are made to a class X tolerance on pitch diameter and class W tolerance on lead and angle. Metric thread ring gages and set plugs are available in coarse, fine, and special pitch sizes. Set plug gages are used to calibrate adjustable style thread ring gages. 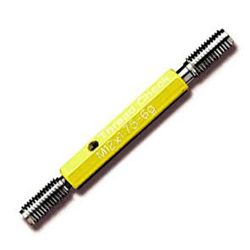 AGD adjustable style thread ring gages can only be calibrated by means of a setplug. Thread Check manufactures many types of special gages including pre‐plates, multiple starts, special leads, acme threads, buttress threads, square threads, extra length thread gages, and custom gages to print. 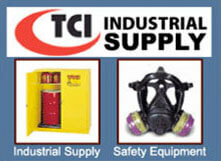 All thread ring gages and set plugs are traceable to N.I.S.T. 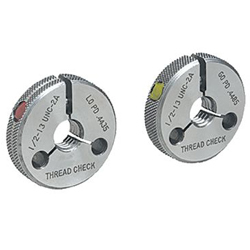 Use thread setting plugs to calibrate and properly set adjustable thread ring gages. Adjustable Thread rings can only be calibrated by this method. Truncated thread setplugs have a thread with both a truncated and a full form thread for both the go and the no go member. The full form section inspects and sets the correct clearance and forms at the major diameter of the ring gage. The truncated section controls pitch diameter. A thread ring gage should be set on the full form portion of the setplug - the back portion. The ring is then turned onto the truncated portion and should have the same drag and fit as when turned through the full form. A ring gage which spins quickly through the truncated section or "shakes" usually indicates wear. The ring gage should be repaired by relapping if possible or replaced. 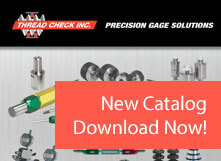 See Technical Info Document - Calibration Procedures for Thread Ring Gages. 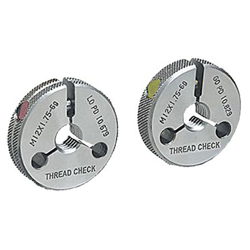 All Thread Check thread ring gages are root relieved for longer life and more accurate gaging. The gages are manufactured with a root clearance in the major diameter which eliminates the possibility of interference from the full form section of the thread setting plug and major diameter of the part being gaged. This feature assures that the thread flanks are making proper contact. Thread Check metric thread gages conform to ANSI/ASME B1.16M gage standard and/or H28 handbook. Special gages including preplates, multiple lead, extra length, etc. are priced on request. lead and flank angle. For class "W" tolerance - add 25%.